Additionally, in the past the scientific establishment has also made claims that high energy-plasma emission from high-output antennas could not effect weather. However, Dutchsinse has proved both of this fact to be plausible for years now. To date, the Naval Research Laboratory has proven in their own facilities that high-output, transmission antennas can, in fact, effect weather. It was just a matter of taking the time to run the tests. It seems that in modern times, the institution of science has become less interested in scientific study, and more interested in receiving attention and admiration for giving a number of correct answers in the past. While receiving this admiration, some of those within this institution have put more energy into maintaining their own reputation, and their steady flow of admiration than they have in accurately recording and report reliable data. This seems to have been the case at the USGS over the last few months, according to two significant videos published by Dutchsinse (among many others). Even still, Dutch carries on. The week of April 4th brought a slew of mid-range magnitude earthquakes, all along the Pacific coast. (These were the focus within this video, though there were many more occuring around the globe.) 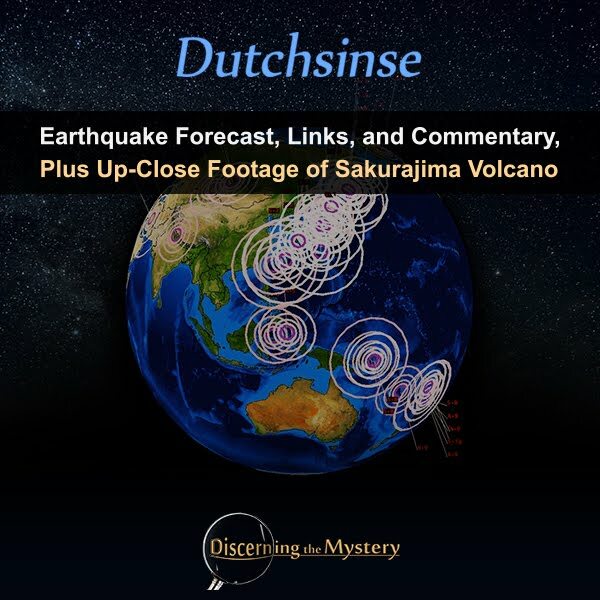 In this video, Dutchsinse shows us a common and recurring trend of seismic occurrences and how we might predict them. One can only guess as to why the world of mainstream geology refuses to advance their own techniques of forecasting. Whether it's fear of the loss of image, or whether there is actually something more significant happening behind the scenes, it has become more and more clear that the establishment does not intend to provide thorough reporting for geotectonic events. However, thanks to reports from attentive observers like Dutchsinse, we still have reliable resources at our disposal. To add to this report, Dutchsinse provided an up-close and personal view of the Sakurajima Volcano eruption from late March of this year. There was not much commentary on this particular video. It's just an awesome sight to see. Keep up to date with the latest uploads from Dutchsinse on his Youtube channel listed below. Also, stop by his website and show your support. Thank you Shem for a great overview of Dutch's work on Earthquake forecasting! I concur with your view on the reasons for suppression of data by Mainstream Institutions & Scientists.